Our week in Cornwall in April was probably my favourite week of the whole year. We’d had a really hard time losing our dog to cancer in March and booked a week away in a gorgeous house in Marazion as a last minute escape for the family. An absolute perfect week by the coast was much needed for all of us. I spent most of the week laughing and forgetting all my troubles. Cornwall has the best food and the most beautiful coastline and if you haven’t been, get yourself down there for a few days and walk the causeway across to St Michaels Mount, a castle in the sea. I promise you won’t regret it. 2017 was not a good year for me in terms of my insecurities and anxiety, but my group of friends proved to be the absolute best humans out there, and I thank them for putting up with me when I was at my lowest and rooting for me when I climbed up the hillside and back on to the path I wanted to be on. Y’all are my heroes and one day, I will find a way to reciprocate that isn’t just me loving on your Instagram posts with the fire emoji. From Edinburgh to Milan to Seville to London to Prague, even to the church in my hometown, my love for architecture has grown even more this last year. One of my favourite parts of travel is architecture and as much as I love a beautiful landscape, nothing beats getting lost in a (sometimes new) city and stumbling upon the most incredible buildings and structures. I was lucky enough to get lost a few times this year and found some gems (of which you can see more on my Instagram). According to Spotify, “Bummin’ Cigarettes” by Maren Morris was my most played song of 2017. I’m not really surprised, I bloody love the woman. Music played a big part in my life in 2017. I discovered some new artists, fell in love about fourteen times and, as cliche as it sounds, music really helped see me through. From finally getting to see Tom Petty & the Heartbreakers and the crowd singing “I Won’t Back Down” to us blagging the most amazing seats for Little Big Town (at the Royal Albert Hall) when my travel plans were cancelled, I really really enjoyed music in 2017 and I hope 2018 brings just as many new incredible concerts, gigs and musicals. I’ve been fortunate to visit a lot of places over the last few years, and one place that I really fell in love with was Prague. We had a really chilled weekend in Prague in April, managing to avoid the crowds and do things at our own pace. One of Prague’s most well known sights is Charles Bridge but there is no denying the place is a tourist trap during the day and much in to the evening too. We wanted to see and experience it without the crowds and the guys trying to sell you a selfie stick, so we rolled ourselves out of bed at 5am one morning and legged it down the hill from our hotel to watch the sunrise. There were only a handful of other people on the bridge and the city was mostly silent. It was a perfect moment. 10/10. You can read more about my weekend in Prague here. I love food, there’s no denying that, and in 2017 I tried lots of new things. From the most amazing duck in Prague to the chicken burger of dreams in Stow-on-the-Wold to over-ordering the tapas in Seville, I tucked in to some really good grub last year. But one thing I ate a LOT of in 2017? Mac ‘n’ cheese. The carby goodness will be to blame for why my jeans are now too tight, but do I have any regrets? No, Sir, I do not. One of the highlights of my year was when we spent the day at BST in Hyde Park, sat on the grass, listening to live music and eating the best mac ‘n’ cheese EVER from The Mac Factory. Life’s simple pleasures. I’d be lying if I didn’t admit that starting my blog was one of the highlights of my year. My friends and family had encouraged me for years to get myself online, to write about the things I am passionate about, and I’m so happy I took the plunge in 2017 and set up this little online space of mine. I’ve smashed my personal goals of page views and brand collabs, way sooner than I ever thought I would. I’m glad I didn’t start it sooner as 2017 really felt like the right time and I am excited to see where I can take Oh Six Eleven in 2018 and beyond. One of my favourite countries is Italy; it has so much to offer, the people are lovely and the architecture and landscapes are stunning. I spent a week there last summer with 3 of my friends and had a beaut time. My favourite day of the trip was when we hopped on a boat from Como and visited Varenna and Bellagio. When we arrived at Varenna, we sat with crêpes and iced tea with the most beautiful views of Lake Como - it was pretty perfect. Varenna was the most picturesque town I’d ever been to; the brightly coloured buildings, the blue lake; it was so unspoilt and if you are ever visiting Lake Como, I’d recommend spending the €25 on a hop-on, hop-off boat ticket and checking out the towns around the lake. Christmas 2017 was my absolute favourite Christmas ever. The year before, I had struggled to get into the festive spirit and the whole season had felt like something was missing. Xmas ‘17 however was a dream. From our annual London trip to see the lights, to my brother proposing to his girlfriend, to the most perfect snow day with Glühwein and iced mince pies, to a family night at Blenheim Palace’s “Christmas at Blenheim”, the lead up to Christmas was perfect. Working in retail, I rarely get time off over Christmas, but this year I managed to escape up north to my Grandad’s for a few days. We ate a lot of pigs in blankets and drank a lot of Bucks Fizz, Mum cooked the most delicious Christmas dinner, and when everyone else was stressing out about wrapping presents and dashing to the supermarket to buy last minute veggies, we were relaxing in front of the fire with a tub of Roses, mulled wine and Miracle on 34th Street. For New Year, a group of us headed up to the Lake District. We stayed in possibly the worst accommodation I’ve ever set foot in, but it was so much fun. 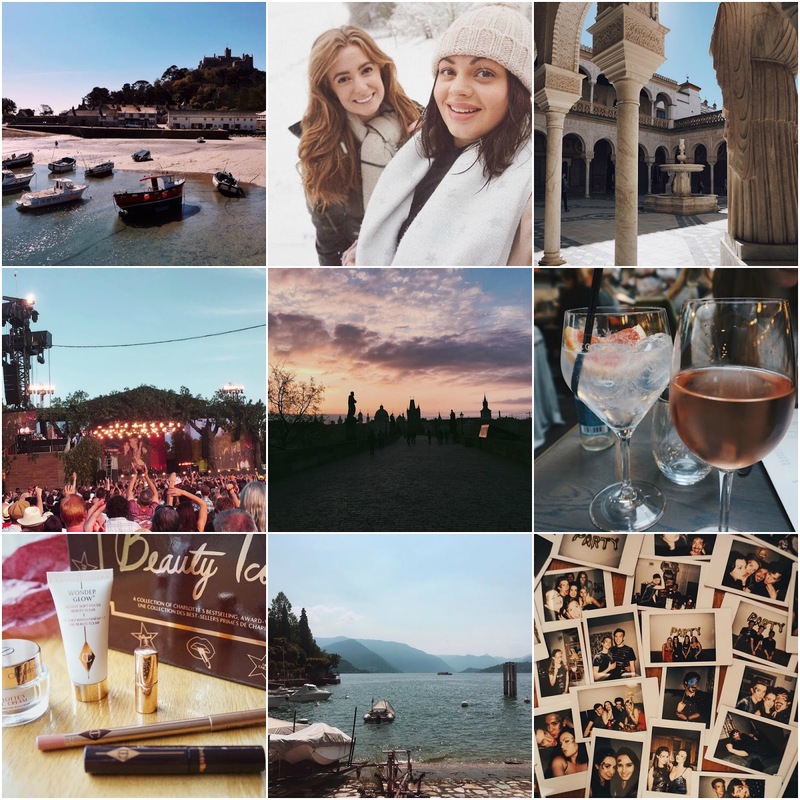 Covering ourselves in glitter, playing games and drinking countless bottles of prosecco and gin, we saw in 2018 in the best way. I have lots of content planned for this year, and I promise to get back to being more active on here and social media. I’m so excited for what the rest of this year has in store, and I hope it lives up to expectations. Thanks for stopping by, and Happy 2018!